At the Vancouver Aquarium, my wife, Litia, and I are standing in a darkened gallery lit by tall glass tanks of neon life. She was born in this city, and talking with her I begin to understand how much of a cultural cornerstone this place is. She tells me of the summer camp day trips; the elementary school fish feeding; the Girl Guides sleepover by the orca tank, within which Finna and Bjossa’s sleek black bodies hovered like dark angels. And now, she is naming the belugas by heart. Aurora was a live capture, one of the aquarium’s last before they banned the practice in 1996. Aurora mated with another live capture, Nanuq (who died at SeaWorld Orlando in 2015), and gave birth to Qila, the first Canadian beluga born in captivity and a rare positive result of the aquarium’s controversial captive breeding program—one that an embattled SeaWorld recently ceased with its orcas. 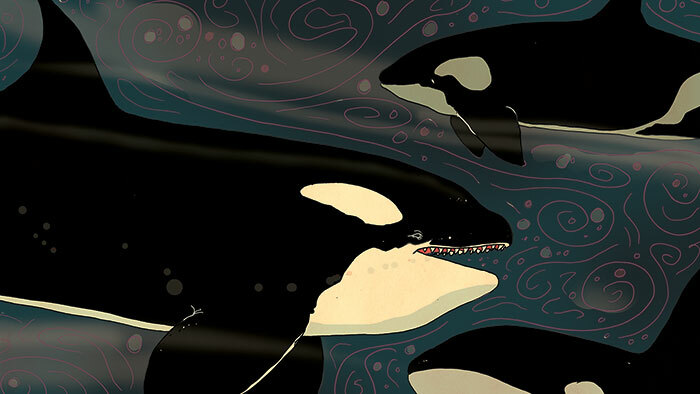 It’s not just that captive breeding of whales is bad, it’s that we are made worse by it. I am taken aback by Litia’s enthusiasm. She’s never told me about her history with this place, but perhaps she’s empowered by her surroundings: the day-care hordes that buzz with anticipation, the posters exclaiming the environmental good the non-profit performs, or the gobsmacking amount of childless adults standing hands-held and in love before the BMO Jellyfish Bloom. The stairs coil around the halibut tank and we ascend into the sunlight of the main attractions, where the belugas’ pool is as wide as one you’d find at an upscale Super 8. Depth-wise, it’s something you could learn to scuba dive in, until you graduate into open ocean. In the rhombus-shaped tank, both whales are swimming laps between the two farthest corners. Arriving at the wall, they somersault like Olympic swimmers and head in the opposite direction. But, within a few flaps of their flukes, they’ve returned. 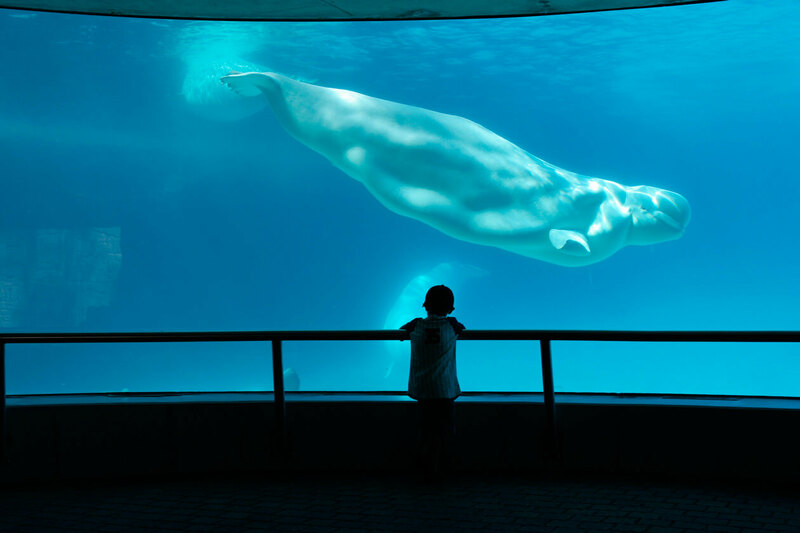 In the past eleven years, the Vancouver Aquarium has watched three belugas die in infancy; currently, it has another four on breeding loan to the aquariums of Chicago, Georgia, and two different SeaWorlds. Watching these belugas in their closed loops, it’s hard not to wonder: when a whale is born in captivity, is there still a part of her that knows the open ocean? Alongside the belugas is a similar tank that interns a Pacific white-sided dolphin, Helen, and a false killer whale, Chester. Helen swims lazy infinities around the tank’s bottom while Chester obsessively bumps his head against a buoy. The crowd screams (one Ray-Banned father urging the obligatory “Do something!”), but nothing distracts Chester from his task. It isn’t until two trainers with Coleman coolers enter the floating dock that he shows any sentience with the outside world. The aquarium points out that captive breeding plays a limited role in its animal acquisition. For example, both Helen and Chester weren’t bred but rescued: Helen was entangled in a fish net that amputated her fins; Chester was found stranded off the coast of Vancouver Island, and, like Helen, will spend the rest of his days in doctor-assisted captivity. False killer whales live up to sixty-five years; Chester’s got another seven until he reaches sexual maturity. If we decide to breed him, all of us currently over twenty will die long before his offspring do. A teenager with a Britney Spears microphone appears on a small cliff above the dolphin enclosure like he’s about to deliver the Sermon on the Mount. As Helen acrobatically twists through the air and Chester floats vertical with his mouth gawked and begging, those of us in the audience are told why we need the aquarium. The employee offers two arguments. The first is that aquariums are the hospitals of the sea: cue Helen and Chester. The second is that we need to see these animals in order to realize their worth, and captive breeding is essential in fulfilling that need: cue Aurora and Qila. But aren’t these arguments incongruous? The first considers captivity to be the best of a bad situation, and in a perfect world there’d be no need for it; the second considers captivity to be not bad at all, and in a perfect world these baby belugas would simply stop dying. St. Lawrence belugas are now the most cancer-prone mammals on earth, even ahead of humans. Closer to home, genteel Victoria continues to flush an annual 34 billion litres of raw sewage into the Pacific, within a current that briskly pumps northwards along coastal Alaska and into beluga habitat. Aurora has been swimming these circles for twenty-four years, but is anyone here willing to argue that the planet is healthier now than it was a quarter century ago? It’s not the aquarium’s fault we haven’t become better; it’s just our nature. The aquarium doesn’t have a single thing to do with the destruction of our oceans. But that’s because there is no connection between keeping animals in captivity and conserving them in the wild. If there were, then the parroted shoulders of pirates would be considered the start of the conservation movement. Maybe the real reason we want whales in captivity has little to do with education or preservation. Maybe it has more to do with how their jaws open by swinging back and up to make it look like they’re laughing, and how their bulbous foreheads bend their mouths into a permanent grin. Maybe it all comes down to wanting to be loved, because it’s kind of hard living day-to-day knowing we’re the only species that won’t be missed. If you are like me, a bleeding-heart vegetarian with little to no scientific background but who still devoutly believes in the godlike sentience of animals, seeing the 11:30 a.m. Trainer Talk—amid the throngs of wide-eyed spectators—will make you feel unbelievably alone. But it turns out that’s a tricky emotion to hold onto when you’re standing behind two small girls in floral dresses standing tip-toed against the handrail. When Helen the dolphin ascends high into the air for the surging finale, the girls become so speechless with joy that all they can do is grab each other’s small and chubby hand. I then notice that the younger girl’s dress is actually embroidered with beluga flukes, not flowers, and I can picture the excitement with which she got ready this morning. Because I too was wild with glee when my ten-year-old self was plucked from the Marine Land audience to rise before the dolphins and conduct them in squeaky song; I too have kissed the whiskered cheeks of West Edmonton Mall’s sea lions; I too have stood in the blue light of underwater auditoriums, placed my hand on the fogged glass, and felt my throat catch with desire. And because now, beneath my collared button-down, I too am wearing my “Whale of a Time” T-shirt that’s adorned with seven different species, including a beluga. I should point out the positives. I remember how delighted Litia and I were in a Fredericton diner when we saw the Vancouver Aquarium’s Ocean Wise initiative—a strategy to promote sustainable seafood—had spread all the way to the Atlantic. The aquarium is also interested in the small, not just the big, and studies krill and algae and the bacterial health of the sea. It works closely with public schools. It champions a bag-free world. And even amid the ever-present echo of wailing toddlers, its staff shows the patience of saints. But support for captive breeding isn’t only an acceptance for able-bodied whales to live and die within a snow globe. Captive breeding, it seems, is a belief that we enjoy an inexhaustible right to view these animals—that we shouldn’t have to leave our entertainment to errant fish nets, wringing our hands on the shoreline, wishing for the blind luck of disaster. It’s not just that captive breeding is bad, it’s that we are made worse by it. The more we captive breed, the more we excuse our slithering pollution and carnivorous propellers. The more we captive breed, the more we afford ourselves the illusion that we are still a long way away from being lonely on this planet. At the end of the day, in the underwater observation area, Litia is checking transit times, and I watch the belugas on my own. There is a moment when Aurora, just before somersaulting to swim another length, makes eye contact with me. My heart chokes with thrill. Litia comes back and asks me what’s wrong, but I want the moment to be mine alone. On the bus ride home, I replay the image again and again, looping it for so long that I hardly notice when the rush of awe is replaced with the slight shame in admitting that we need them more than they need us. The first calf has been born at a Canadian aquarium. Will it survive?